Loew defiant as France sink Germany | Daily Express Online, Sabah, Malaysia. PARIS: A defiant Joachim Loew (pic) praised Germany's display in Tuesday's 2-1 Uefa Nations League defeat by world champions France as he lamented "a totally unjust penalty" awarded to the hosts.Antoine Griezmann hit a pair of second-half goals, including the winner from the spot, as France recovered from falling behind to a Toni Kroos penalty to inflict a sixth defeat on Germany in their past 10 matches. The result eliminated Germany from Nations League title contention, and left them needing to beat the Netherlands in their final group match on November 19 if they are to avoid relegation from the top tier. However, Loew insisted he was "very pleased" with the performance as Germany were much improved compared to the team that lost 3-0 against the Netherlands in Amsterdam. "I'm disappointed with the result, although though I must say the defeat is different to Saturday's," said Loew. "Not because of the result but because of the performance. I'm very pleased with the performance. "I think we were on an even level with what is probably the best team in the world. But France has a lot of individual quality, and if you're not careful you'll get punished straight away." A first defeat to the neighbouring Dutch in 16 years prompted Loew to make five changes for the trip to Paris, as he injected additional pace into the attack with the inclusions of Leroy Sane and Serge Gnabry. The Germans deservedly led through a Kroos penalty after a sliding Presnel Kimpembe handled a Sane cross, but Loew's youthful frontline was unable to capitalise on further opportunities. "The negative point is the converting of our chances. We were unable to put the ball in the goal," said Loew. "I think we deserved to win because we were the best team but that's not how things work. We lacked a bit of intelligence and sangfroid. If we'd been able to score a second we could have played in a calmer manner and won the match." 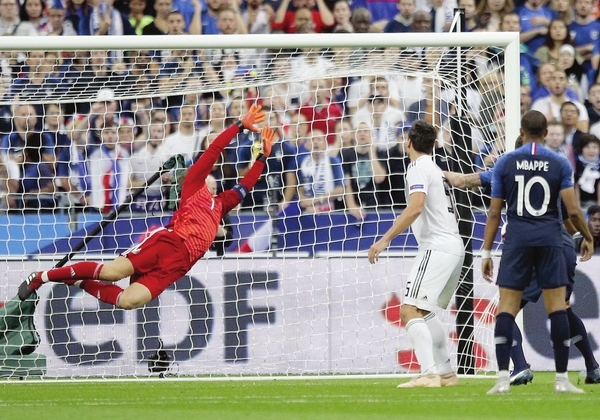 Griezmann equalised with a magnificent glancing header from a Lucas Hernandez cross on the hour, and the Atletico Madrid striker won the game for France with a penalty 10 minutes from time. Loew was particularly unhappy with referee Milorad Mazic's decision to award France a spot-kick after Blaise Matuidi went to ground after a tangle with Mats Hummels. "The penalty was totally unjust," said Loew. "I've watched it back on the replay. Mats didn't touch Matuidi. He stepped on Mats' foot and then slipped."